This month, I am presenting a diagnosis case that was unusual. Patient is a 41 year old Caucasian female who presented with the Chief complaint of sudden pain on the left side of her face and dentition for the past 2 days. Her medical history is unremarkable with the only medication she is currently taking is Ibuprofen for the control of her sudden onset of pain. 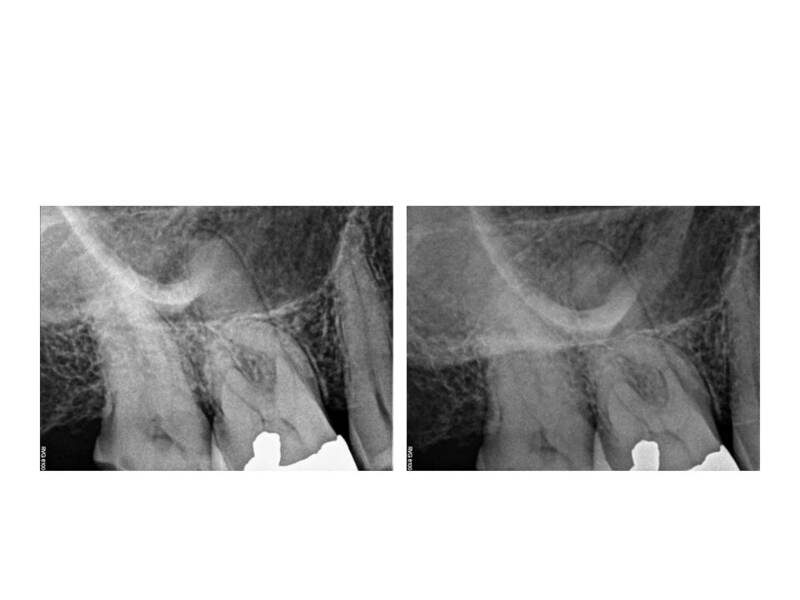 The patient was seen by her dentist and referred for evaluation of tooth #19 due to radiographic apical pathology. Clinically, tooth #19 has an MOD composite restoration with good margins, normal (similar to adjacent teeth) response to cold, negative percussion tenderness, slight palpation tenderness and very mild cortical plate expansion near the distal root end, normal periodontal probing depths, no mobility noted. 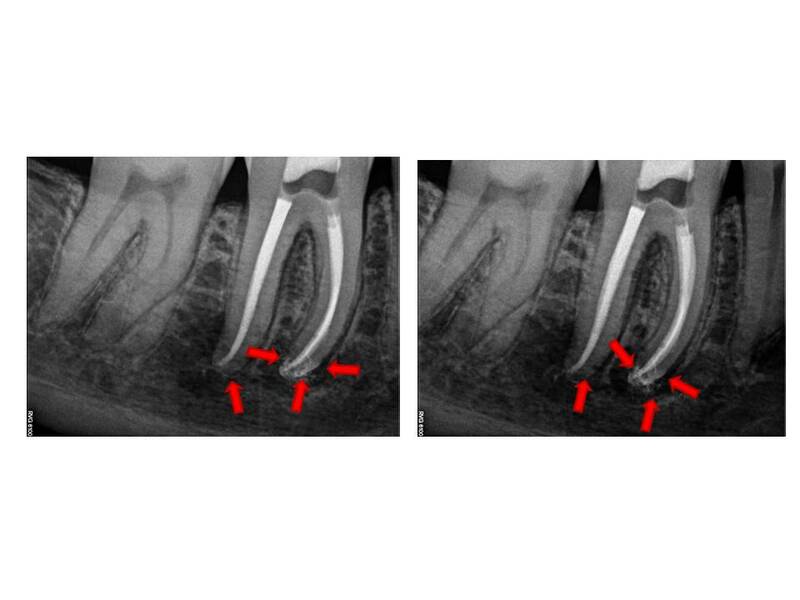 Radiographs reveal conservative composite restoration present, a circular RL lesion (12 x 12 mm) associated with the distal root end. The outer 2-3 mm circumference of the lesion appears more radiodense while the center appears more lucent and has an irregular trabecular pattern. External palpation of the left Masseter and Temporalis muscles produces some mild discomfort. From the clinical and radiographic exam, I will aske the question as to whether this is a LEO(Lesion of Endodontic Origin) or non–LEO? I present the radiographs for this case. 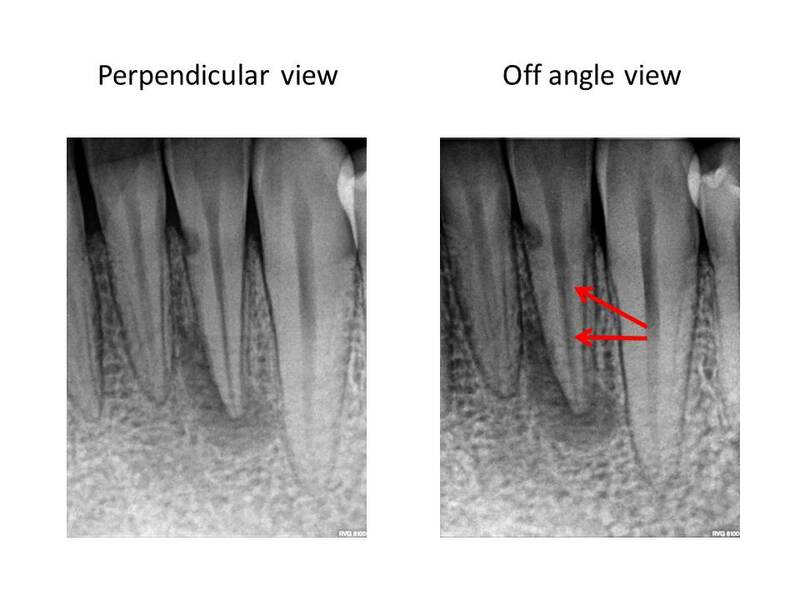 Since the tooth responded similarly to cold as the adjacent teeth and the restorative treatment was conservative, I initially did not think this was an endodontic issue. The pain the patient was reporting as sudden onset was actually related to nocturnal bruxism and stress as she was getting married in a few days. So, I have ruled out root canal treatment. What is the differential diagnosis? What are the potential treatment options for this case, if any? The diagnosis is #2. Focal cemento-osseous dysplasia. Review of the patient’s pano did not reveal any other locale for additional pathosis. If so, this would be a case of Florid cemento-osseous dysplasia. Treatment is observation, unless the lesion becomes large enough to cause discomfort. In which case, enucleation of the lesion would be indicated. These lesions become problematic when they become large and communicate with the oral cavity. Also, hypovascularization can occur and these lesions can be prone to necrosis with minimal provocation. 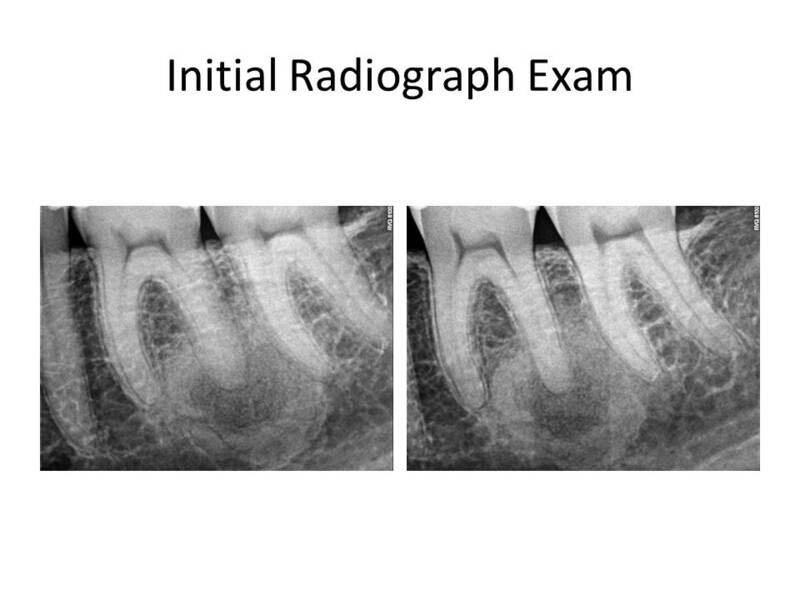 At this time, annual radiographic examination is the only treatment recommended. Thank you for the opportunity to serve your practice and patient’s needs! This month, I wanted to show some unusual anatomy cases that I have recently treated. Some of the anatomy is difficult to discern from the preoperative images. However, close examination does reveal that the canal anatomy is not typical. I usually try to visualize the root canal space from the top to the apex of the root. In doing so, I am not only anticipating what my final outcome will look like, but to also search for clues that the canals are atypical. Careful intraoperative imaging as well as tactile feel of what the files are doing provide clues to the root anatomy. Thanks again for your trust in our practice. If you have any questions or comments, please let me know. Happy New Year! Thank you again for your confidence in our practice. We continually strive to provide the best endodontic care for our patients. This month I will provide some examples of a new type of endodontic file that has come to the market. This file has the same nickle-titanium properties that are present in almost all rotary files plus an additional treatment in which the file does not retain shape memory. Why is this of benefit? 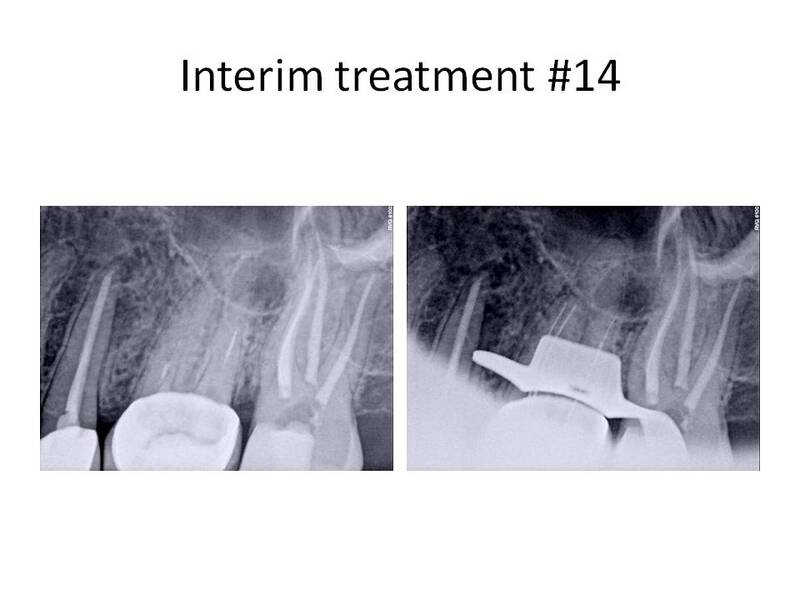 This allows the file to closely follow the anatomy of the canal without straighting out, reducing the risk of ledging, transportation, and perforation. 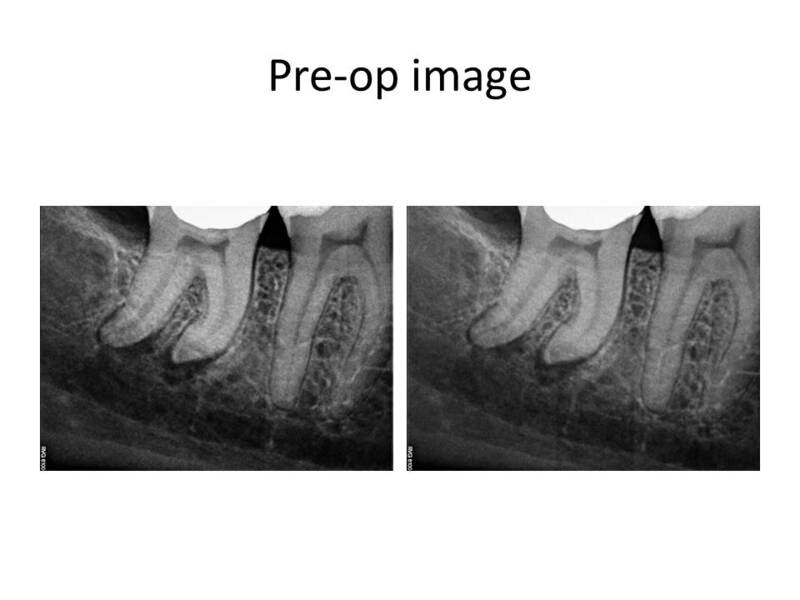 It also reduces the amount of tooth structure that is removed during the instrumentation process. The particular file that I use, also has a shorter cutting area, which again will reduce the amount of root structure removal. 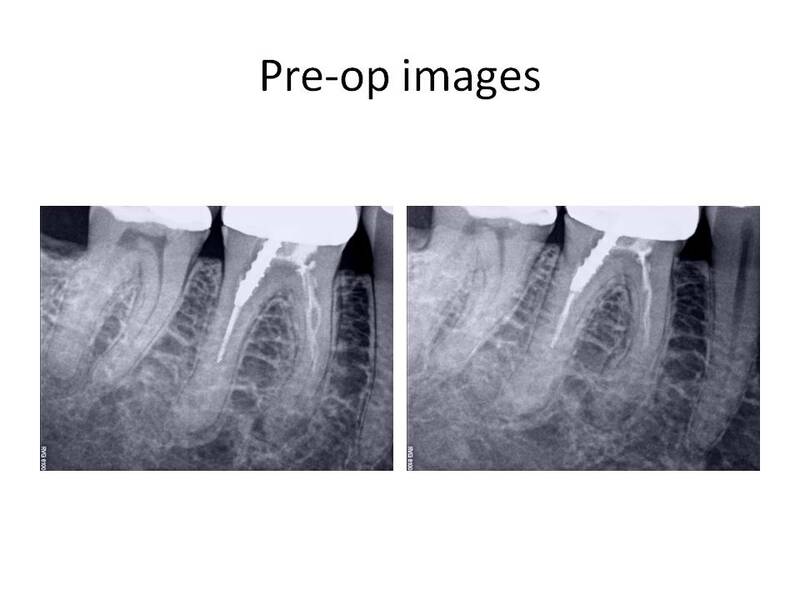 In conjunction with the conservative access preparations I strive to attain, there is a reduction in the probability of vertical root and coronal tooth structure fracture. I will add that the apical preparation size is still significantly enlarged enough to provide for irrigation. 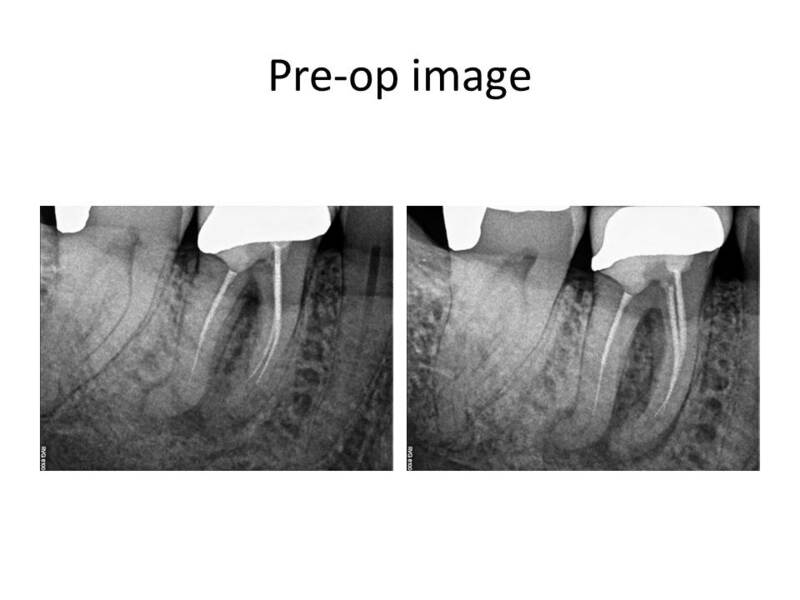 I recommend that the final apical preparation be completed with files with a maximum of 0.04 taper to minimize the development of root microfracture. I am not implying that apical preparation sizes should be miniscule. 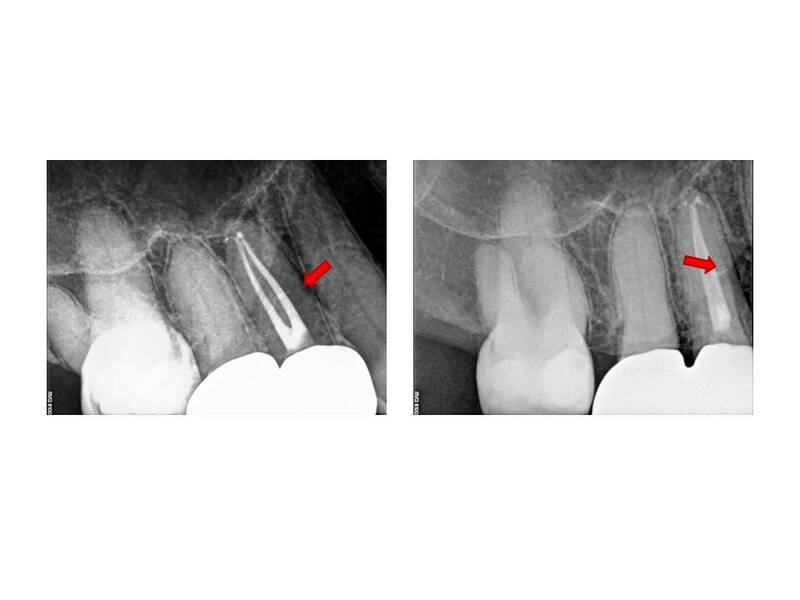 However, the apical preparation should be gauged and appropriate for the respective canal. 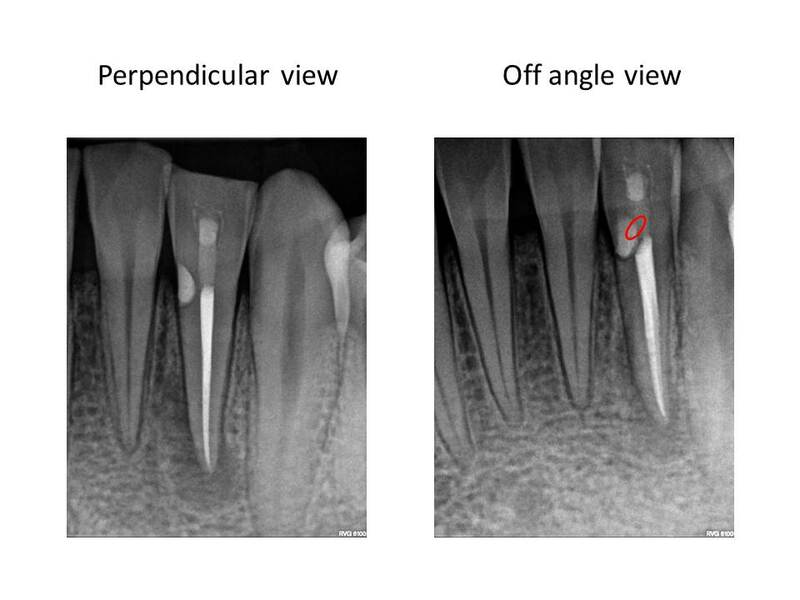 The introduction of larger taper (.06 and .08) tapers should be minimized in the apical third to reduce the incidence of file separation and excessive dentin removal. I provide some examples of some recent cases. Thank you and please feel free to comment. 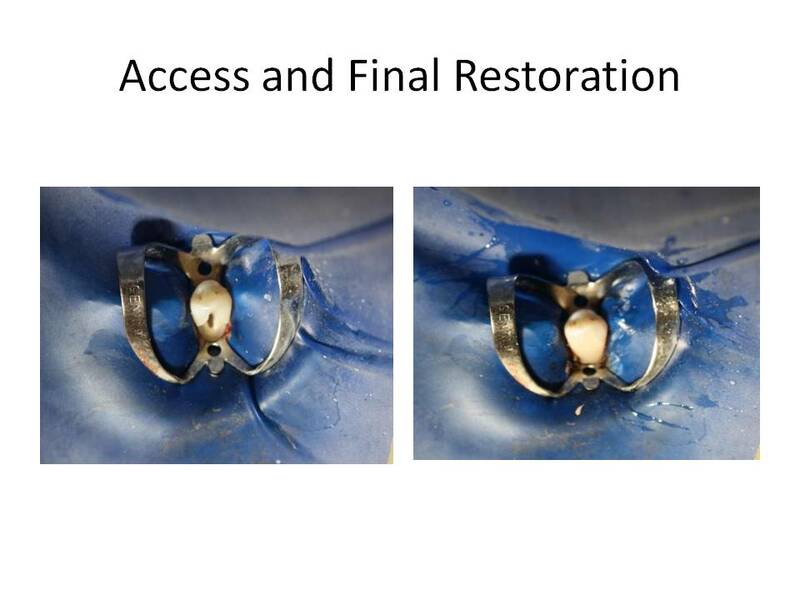 This month’s blog addresses the topic of conservation of tooth structure. 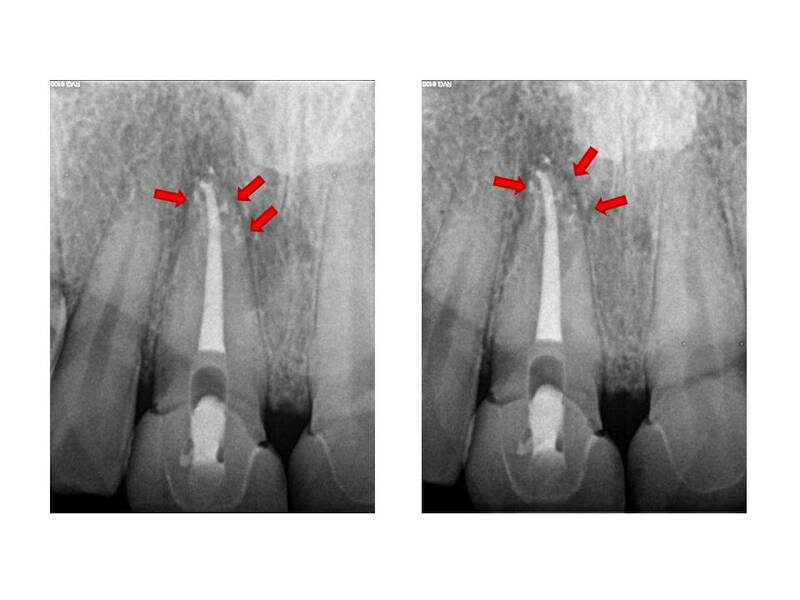 In many of today’s dental journals, one can find a myriad of debate concerning the proper way to clean and shape root canal systems. I will address one particular type of canal system that is commonly found. A ribbon shaped root canal is one in which is typically found in maxillary premolars, mandibular incisors and the distal roots of mandibular molars. 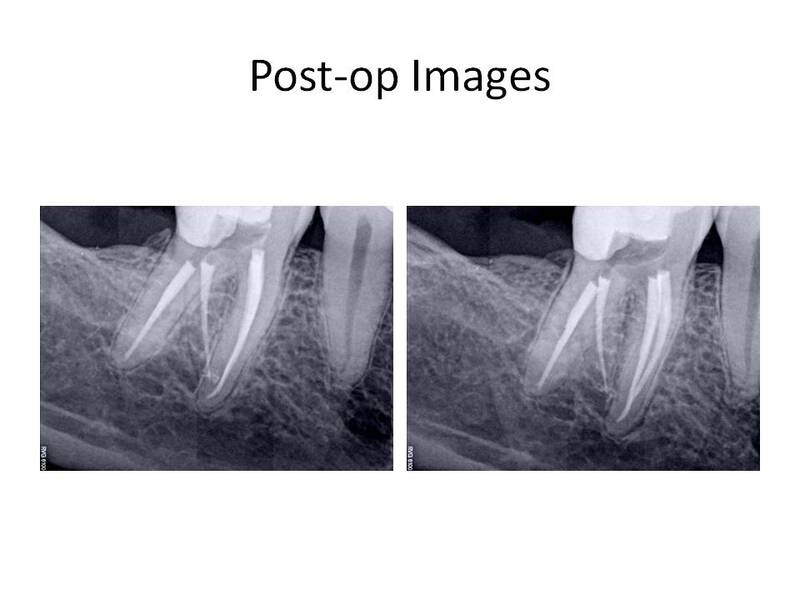 The problem with this type of anatomy is that traditional preparations result in excessive removal of root structure which may lead to vertical root fractures or perforation of the root. I have modified the preparation of these types of canals to address these concerns. 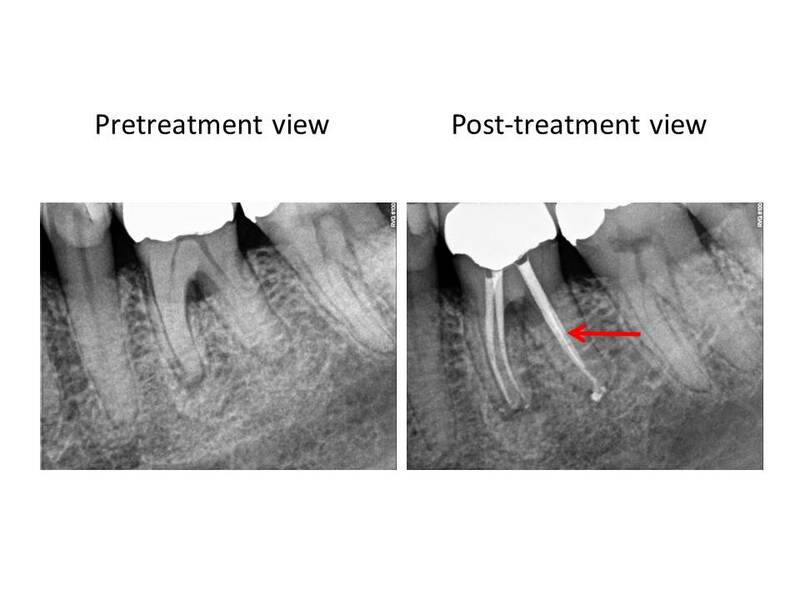 As noted in the following illustration, a typical canal preparation, if enlarged to encompass the periphery of the canal system, would result in excessive canal preparation and a weakened remaining root structure. Therefore, I propose modifying the preparation to address the periphery first. This will result in a more conservative preparation. It will also better facilitate the cleaning and shaping the lateral extents of the canal system where typically a fair amount of debris is accumulated during the instrumentation process. This is an example of a mandibular incisor in which 2 canals were present. 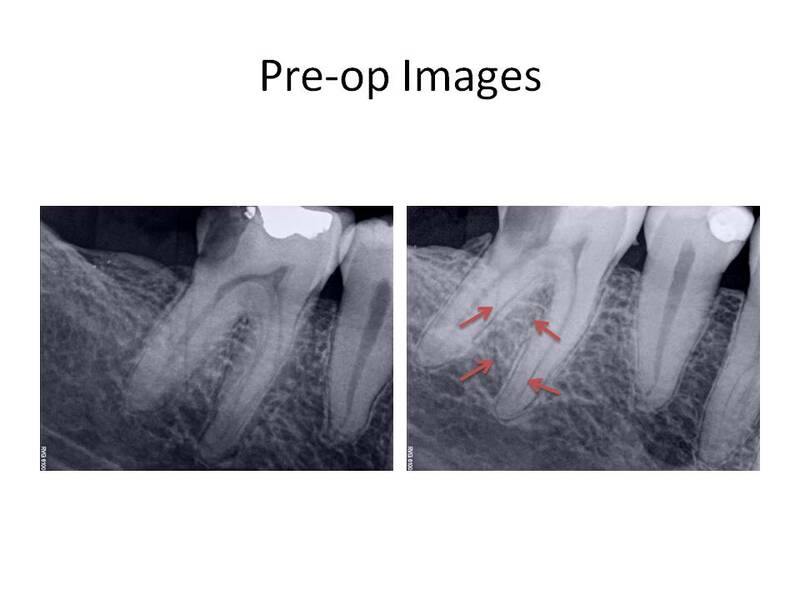 As illustrated by the red outline in the final radiograph, one can see the results of this modification. The canal outline almost appears like a figure eight. This is an example of a mandibular molar in which the same approach was utilized. Thank you for supporting my practice. I am open to any questions or thoughts regarding this months post. I strive to elevate my treatments to the highest possible level. 1. Preparation design – Step-back, crown-down, double flare, balanced force, modified crown-down, passive step-back, ultrasonic, rotary instrumentation, Self-adjusting file (SAF). 3. Chemical means – a chleator either in a cream form applied to the file(RC prep, Prolube, File Eze, Glyde) or an irrigant such as Citric acid, 17% EDTA, Smear Clear, Maleic acid as a final solution prior to obturation. 4. Irrigation solution agitation – Passive ultrasonic, Active ultrasonic (Peizoflow, and there are many others), Tsunami irrigation (Ruddle), Endovac, Continuous Irrigation (SAF). 5: Use of additional irrigants for bacterial removal and canal disinfection – Alcohol, 2% chlorhexidine, Q-mix. 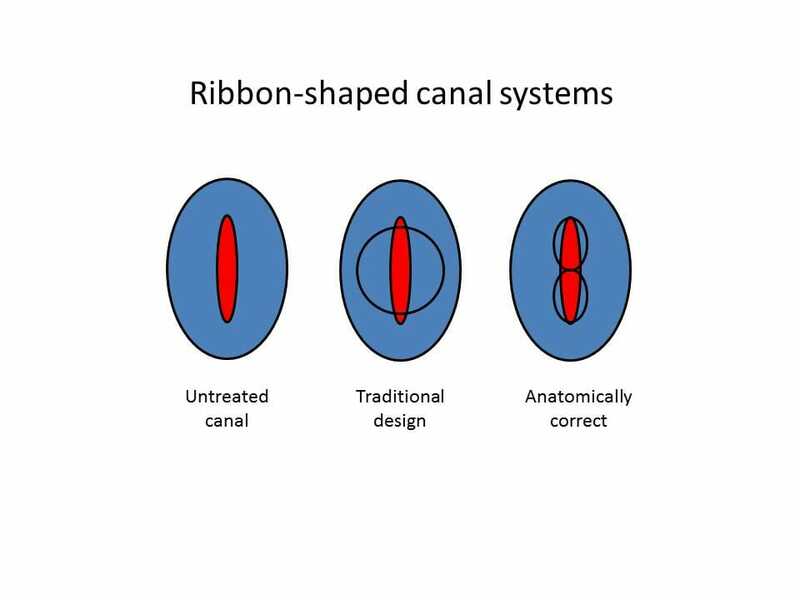 The aformentioned categories are a majority of what has been attempted to produce a canal system in which the residual bacterial load is minimal and there has been a removal of the tissue and debris from lateral canals and canal isthmuses. These, of course, are not all inclusive and there are other steps and solutions that have been attempted. In my experience, and these are my own thoughts, I think that prevention of a smear layer early on during canal preparation is essential. Playing catch-up after debris has been created and packed into the isthmuses and lateral canals is much more difficult to remove. 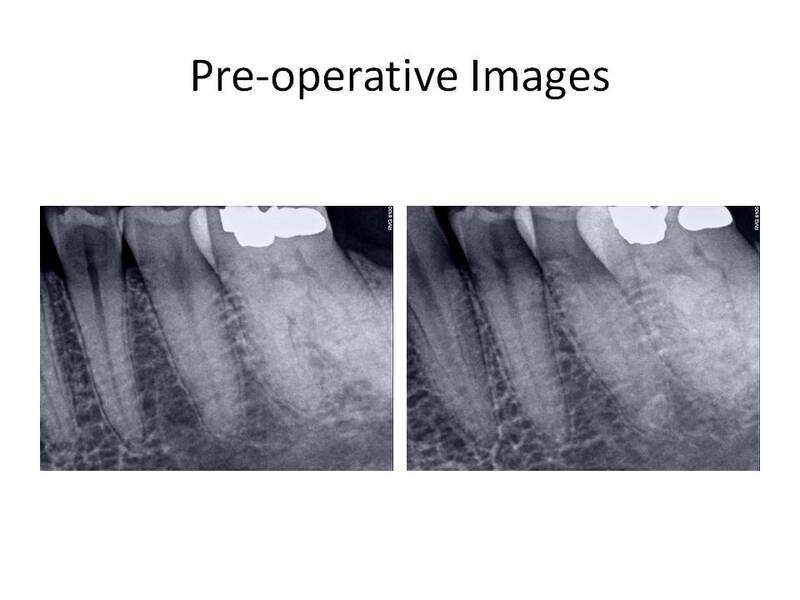 Since I have modified my irrigation routine, I have noticed that the amount of lateral canals that are evident post-operatively, have appeared more often. 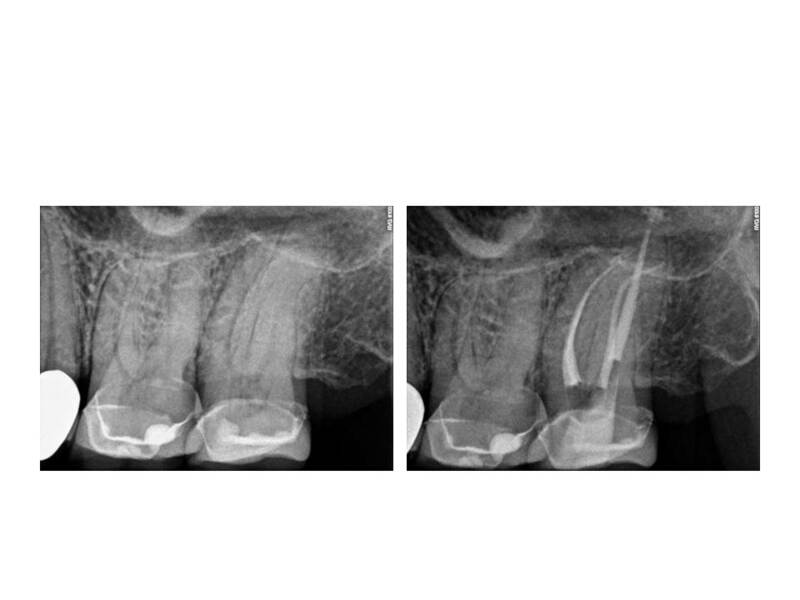 I offer these examples as support for this change in canal preparation. In addition to the modification in irrigation, I still use ultrasonic activation of sodium hypochlorite as a final step. 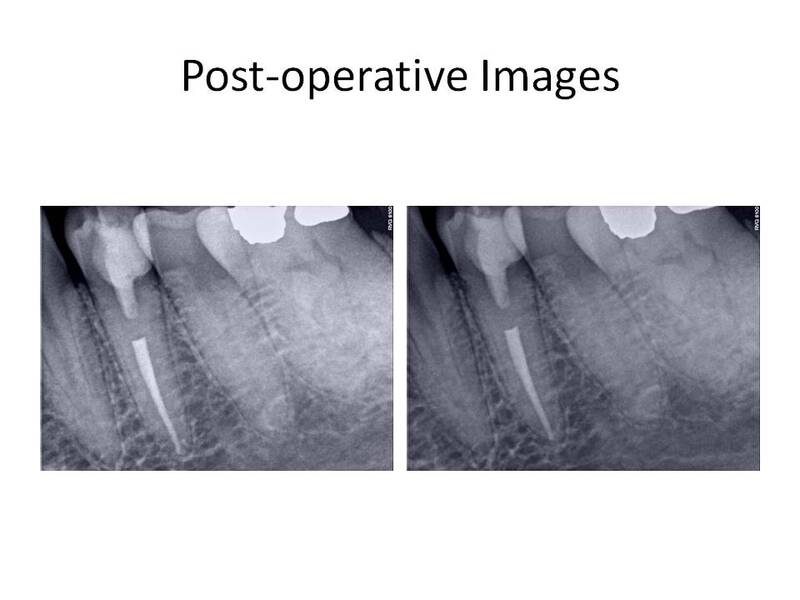 By adjusting the thought process of haow the root canal system is approached, I believe we are able to produce cleaner canals and therefore, increased endodontic success. I am open to any questions or thoughts regarding this months post. Thanks again for supporting my practice. I strive to elevate my treatments to the highest possible level. This month I am presenting a case of an atypical root anatomy. The patient is a 37 y.o. male who presented for evaluation of tooth #30. He was experiencing spontaneous pain and cold sensitivity on the mandibular right side. Clinically, tooth #30 had gross caries, hyperreactivity to cold that lingered, slight percussion tenderness. 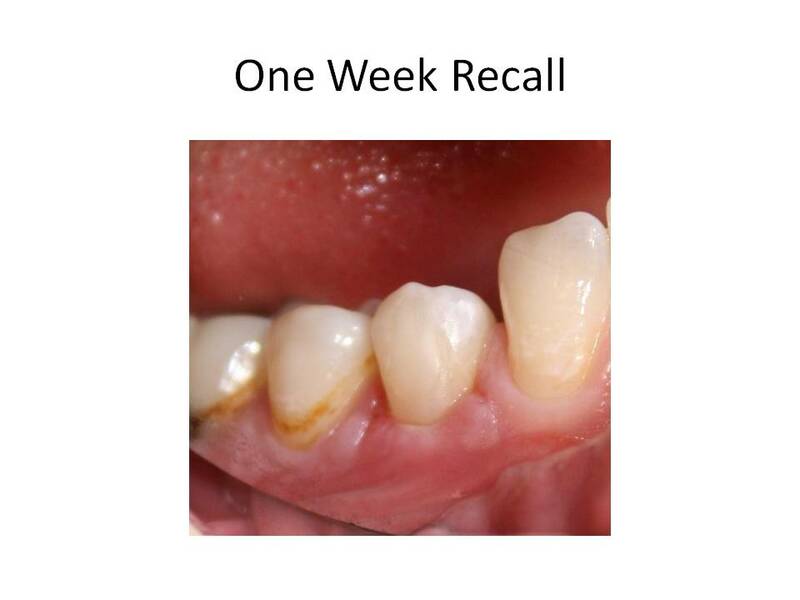 Periodontally, the patient had detectable calculus and gingivitis associated with the tooth. He was also missing teeth #31 and 32. 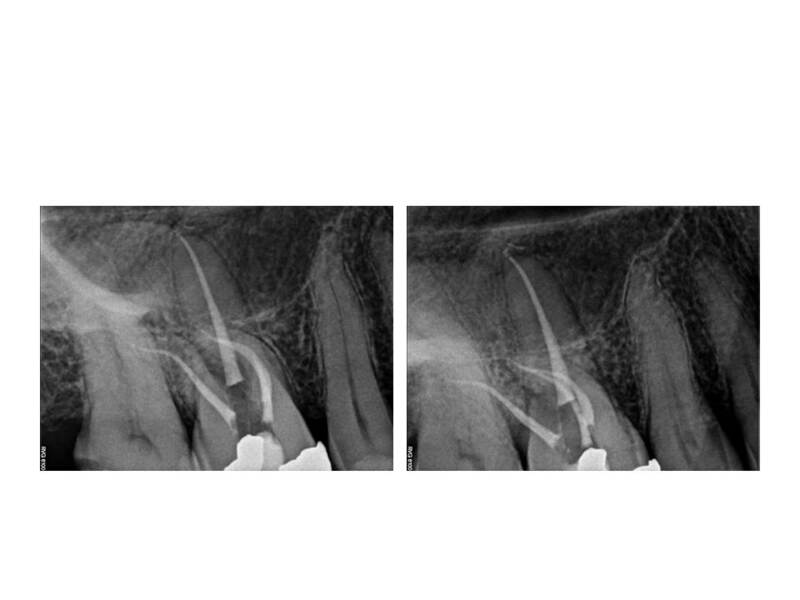 Radiographs revealed that the caries approximated the pulp chamber and calculus was present on the mesial root surface. 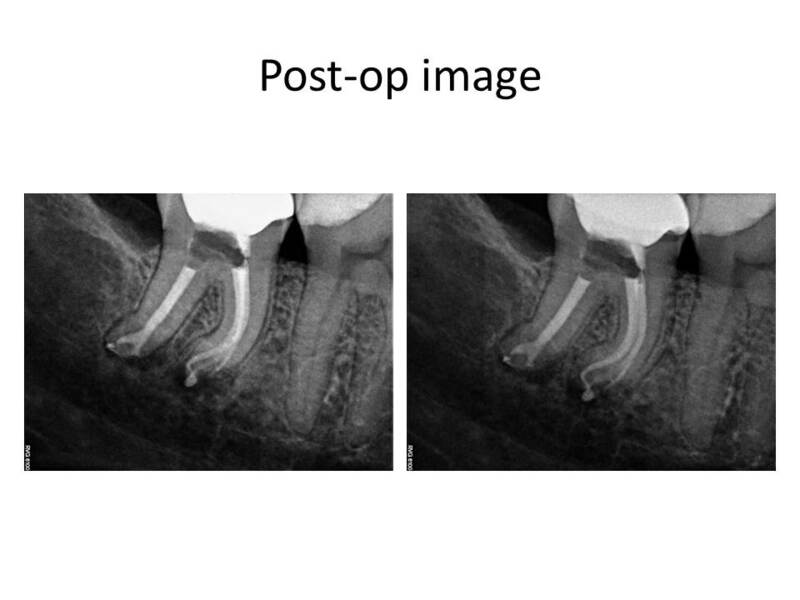 A vertical line was noted across the distal root indicating the presence of additional root anatomy in both preoperative images. The periradicular tissues otherwise appeared WNL radiographically. As you can see, I have outlined the PDL/Lamina dura in the second radiograph. This type of root anatomy is known as radix entomolaris. 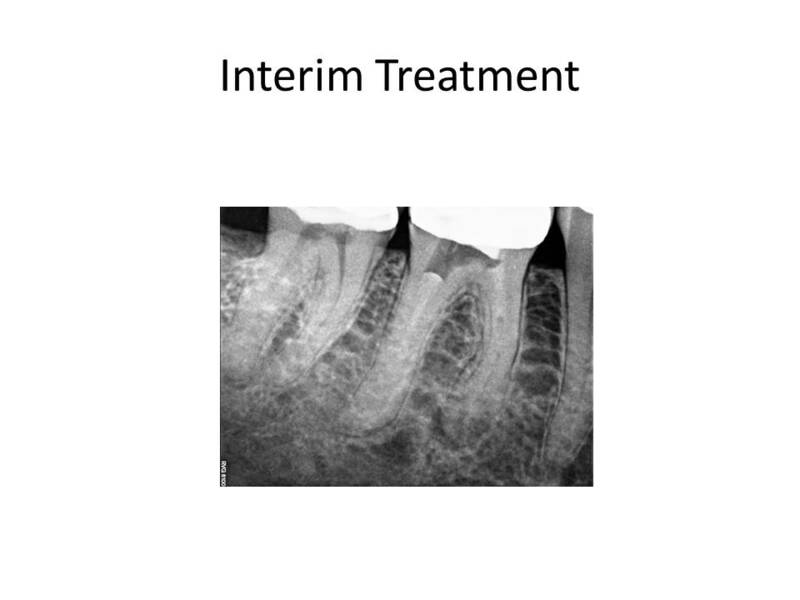 Treatment involved caries removal, GI tem restoration, and RCT. Here are the post-operative images. I welcome any comments or questions. Thank you for your continued confidence in me and my practice. This month’s case is entitled “If you can’t beat ’em, bypass ’em”. The patient is a 29 y.o. female who was referred for evaluation #15 for possible RCT. She was asymptomatic at the time of presentation. Exam revealed gross caries mesially. Pulp tests revealed tooth #15 had a hyperreactive response to cold, normal periodontal probings and negative percussion tenderness. 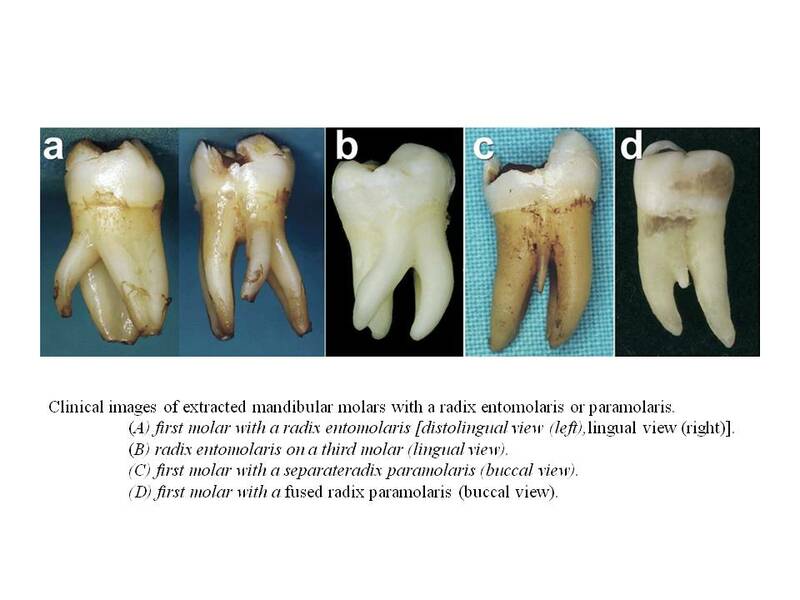 Radiographs revealed normal periradicular tissues and caries that approximated the pulp chamber. 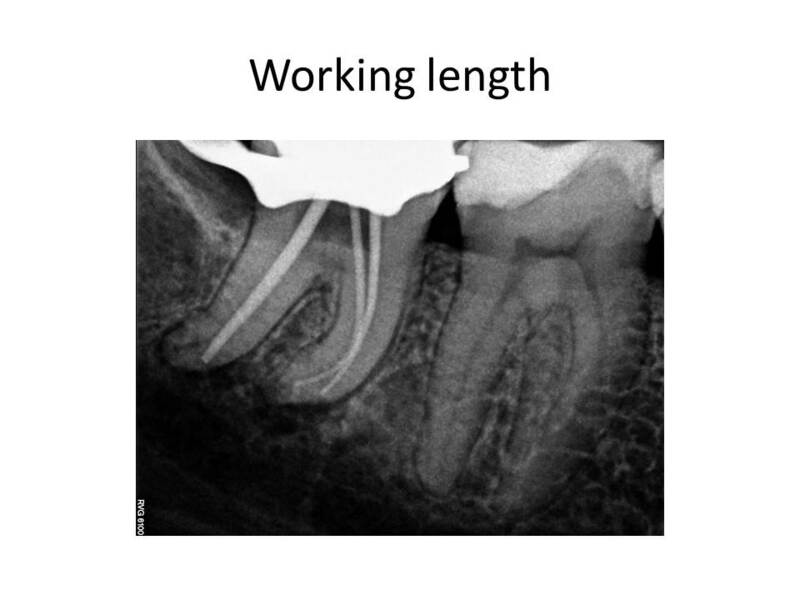 Radiographs also revealed that tooth #14 had previous RCT. 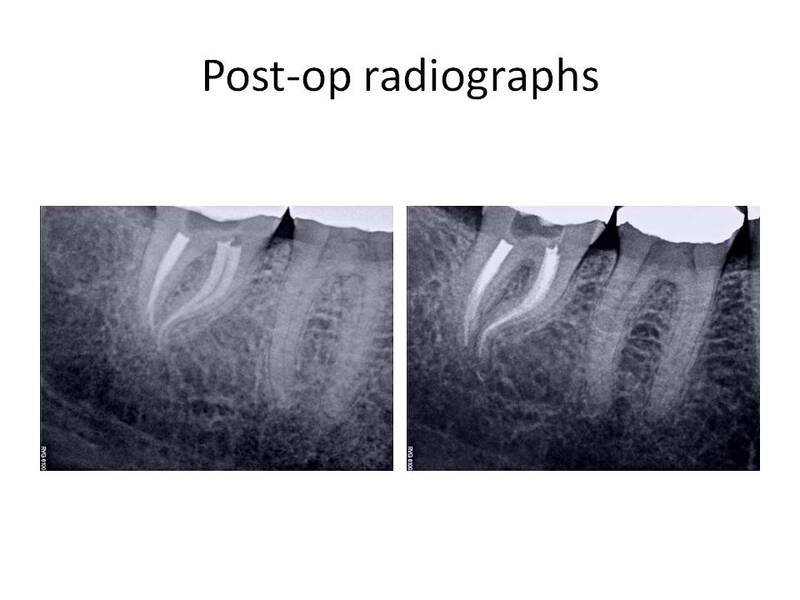 It was noted that there was a RL lesion associated with the DB root, a separated instrument in the DB root and the canal was instrumented well short of the radiographic apex. Tooth was asymptomatic to percussion and probing depths were WNL. 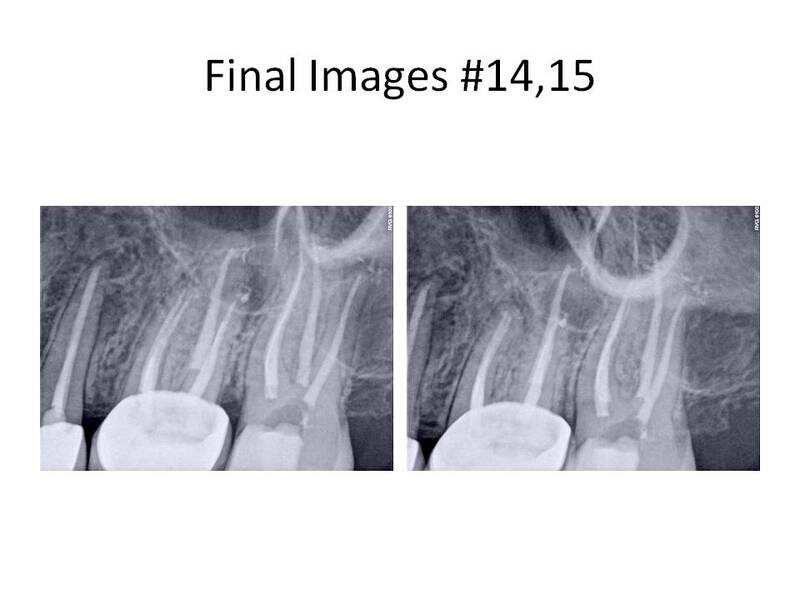 Tooth #14 was treatment planned to have the crn remade by her referring dentist. The only positive entry in her medical history was Synthroid for hypothyroid. Clinical Dx #15: Caries #15, Asymptomatic irreversible pulpitis with normal periradicular. Dx #14: Previously treated #14 with asymptomatic periradicular periodontitis. Tooth #15 was treated first. The caries was removed and a vital pulp exposure occurred. 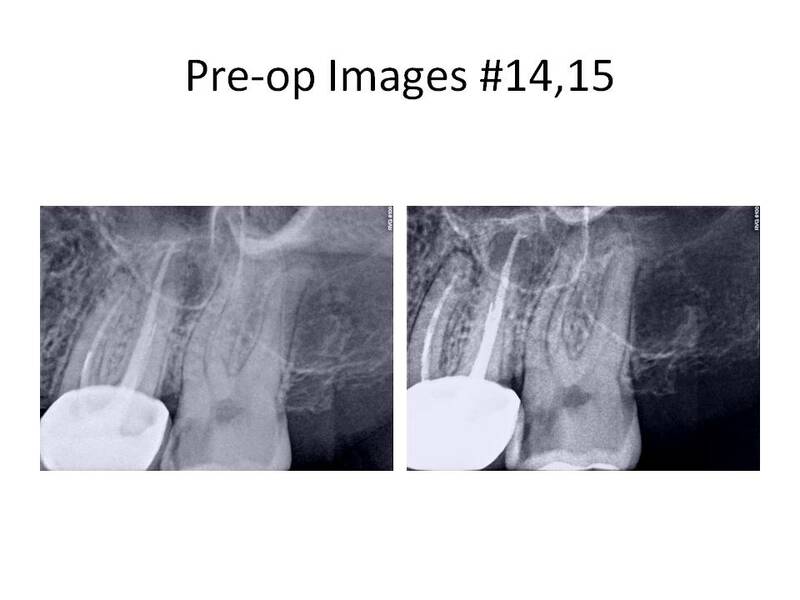 The root canal was completed and the patient was appointed for retreatment tooth #14. I will focus on tooth #14 for the remainder of this month’s blog. Tooth was accessed and the Softcore obturation was removed, an untreated MB2 canal was located and instrumented to the apex. An attempt to remove the instrument was not done at this appointment. Calcium hydroxide was placed as an interim medicament and the patient was scheduled to return in 1 week for completion. At the next appointment, the file was bypassed to the apex and the root canal was completed. Happy New Year to all of you! 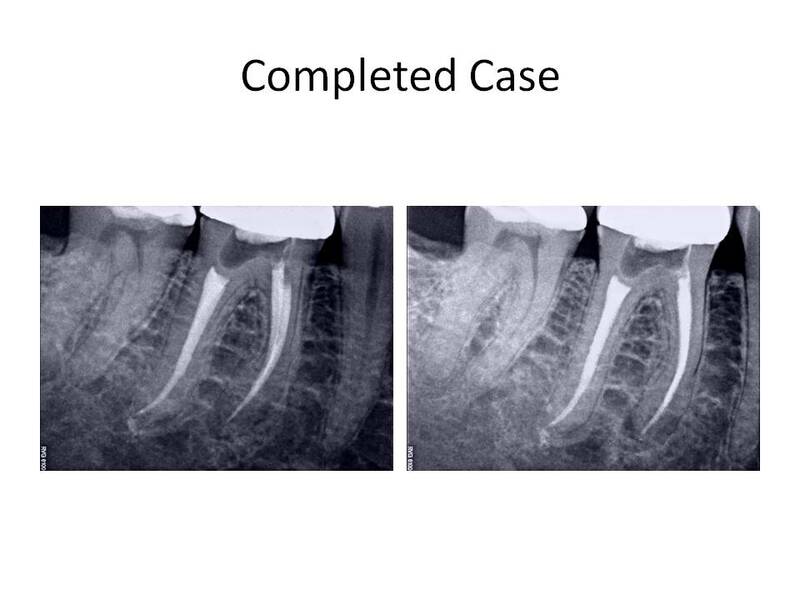 This month, I am presenting a case of a severely dilacerated meisal root on tooth #31. The patient presented with CC of sensitivity to cold ever since she had a crown placed on the tooth. She had cracked the tooth or exisiting restoration that was present, and therefore, required a crown on the tooth. The patient had increasing sensitivity to cold over the past 3 months. Clinical exam revealed a FGC tooth #31, hyperreactive to cold that was more pronounced and lingered significantly more than the adjacent teeth, slight percussion tenderness, normal periodontal probing depths. Radiographs revealed a S-shaped mesial root #31 with no periradicular pathosis visible. Her medical history had positive entries for ovarian cancer 10 years ago and PCN causing nausea, but otherwise unremarkable. 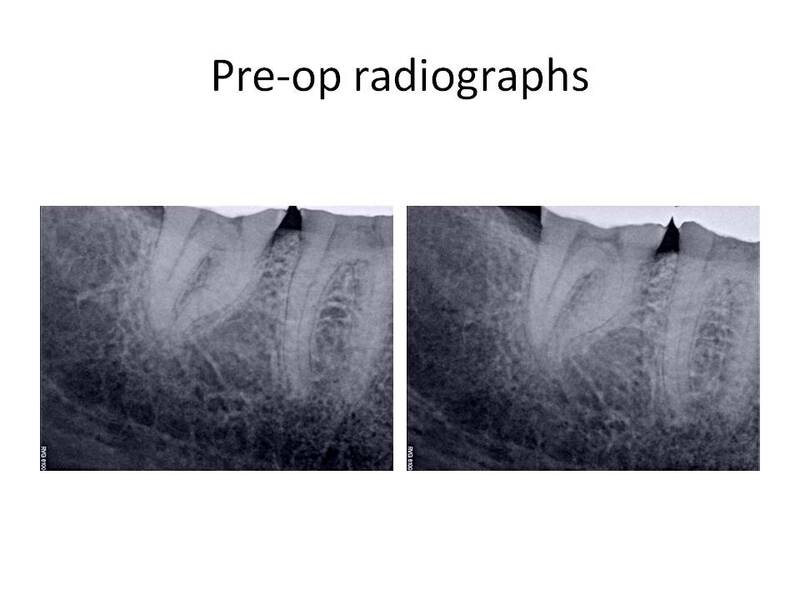 Here are the pre-operative radiographs. The clinical diagnosis was Irreversible pulpitis #31 with symptomatic periradicular periodontitis. The informed consent was signed and administration of local anesthetic was given. After several injections, the patient was still unable to achieve profound anesthesia. I had used 1 carpule of each anesthetic to attempt to adequately numb the area ( 2% Lidocaine with 1:100,000 epi, 3% Mepivicaine, 0.5% Marcaine with 1:200,000 epi, 4% Articaine with 1:100,000 epi). She was given an IAN block, a Gow-Gates, PDL, Buccal Nerve and Lingual Nerve, and an infiltration injection. 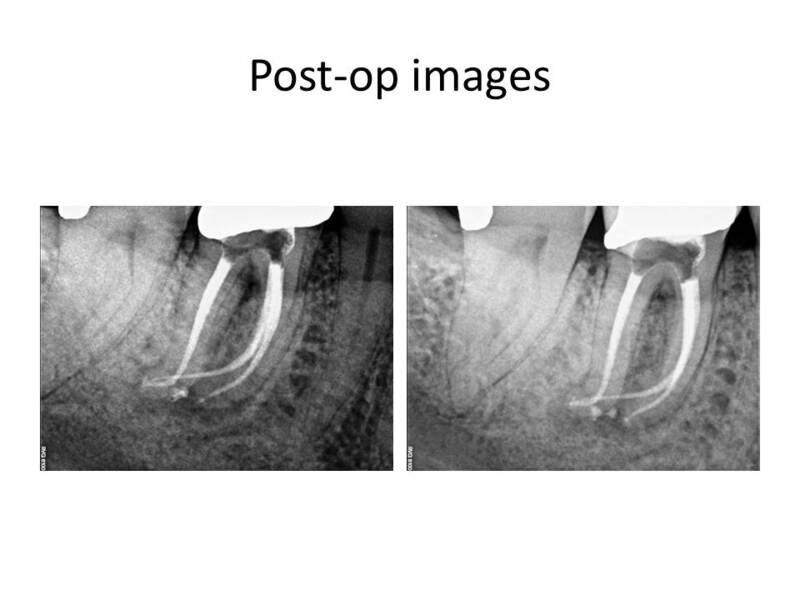 The endodontic treatment was not attempted, due to lack of profound anesthesia. The patient was dismissed and I recommended that she take 3, 200mg Advil Liquigels 30 minutes prior to her next appointment to help with the anesthesia. There is a paper by Dr. Ken Hargreaves that discusses the use of local anesthetics and how the pH is affected by increasing amounts of epinephrine and why different anesthtic types without epi can be beneficial in these situations. Also, he talks about the need to close the TTX channels with the administration of an NSAID that are typically resistant to local anesthetics. 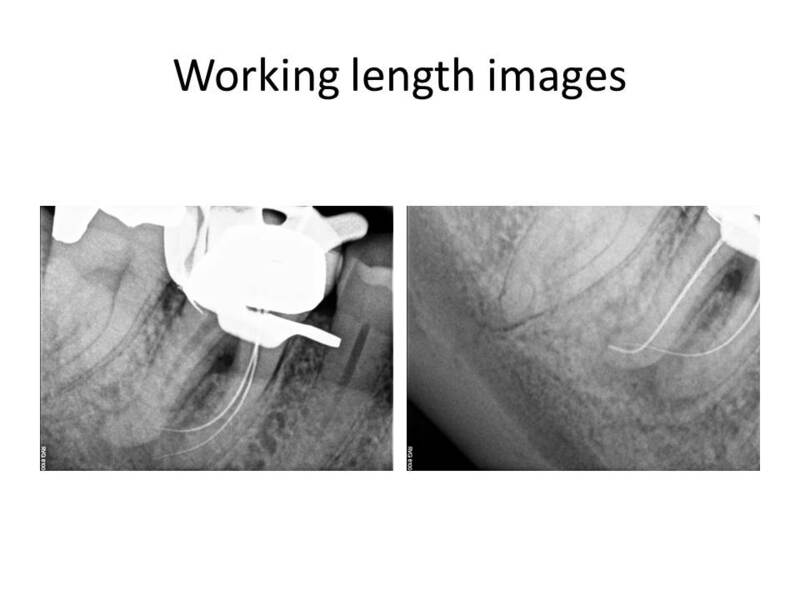 The final radiograph demonstrated two distal canals, one of which (DL), exited very short of the other. I welcome any comments or questions. Thank you for your continued confidence in my practice.